We recommend 100 steel U-pins per roll for grass reinforcement mesh 2m x 10m rolls. 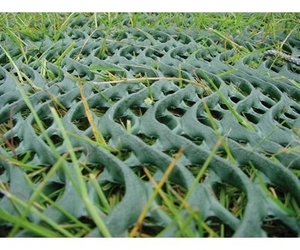 Protection matting that allows the grass to grow through while preventing excess worn grass, rutting and muddy areas caused by car wheels and heavy pedestrian walking across grass. This 2mx10m roll of 14.5mm thick plastic mesh is designed to be installed directly onto the turf and fixed in place using our steel fixing upins. TERRAM GRASSPROTECTA heavy grade grass protection mesh spreads vehicles loads, limiting rutting and as the grass grows through the mesh holes, the plastic reinforcement mesh filaments intertwines with the grass roots creating a strong interlock which helps stabilize the grass and protects the roots from being damaged by car wheels and excessive traffic. In the spring and summer growing season, the mesh can be laid and becomes and invisible structure on the surface within just a few weeks.